With any luck, Nicki will pop tomorrow. It’s the second pregnancy for the 30-year-old mother; her rambunctious son, Chase, is four. And like all expectant mothers, with nine months of nausea and water retention to deal with, speculating about the baby’s gender is one of pregnancy’s rare perks. But at least she’s wise enough to admit it, unlike the showy Hollywood crowd. Before making the talk show round proclaiming her certainty that her new baby was a girl, rumour has it Kate Hudson tried an old elementary school staple: hanging a ring on a string above her bulging belly. A back-and-forth swinging motion means boy; circle means girl. That’s just one of countless old wives’ pregnancy tales, and each one’s weirder than the last: A baby girl steals her mother’s beauty, causing acne and stretch marks. If the dad-to-be gains weight, it’s because it’s a girl (not because of those midnight ice cream runs). If mom craves meat and salt, it’s a boy; sugar and cake, it’s surely a girl. Deny these cravings, and your child will be born with a birthmark in the shape of said food. If that all sounds absolutely ridiculous to you, then you’re probably not hanging out with a posse of pregnant ladies. Or their mothers, for that matter. Case in point: Nicki’s pregnant friend, for example, craved an oversized soft pretzel from the movie theatre. Her husband refused to comply, but when the mother-in-law got word, she headed straight to the local Cineplex, lest her grandchild be born with an unfortunate pretzel-shaped freckle. But not so fast, Nicki and other mothers-to-be. 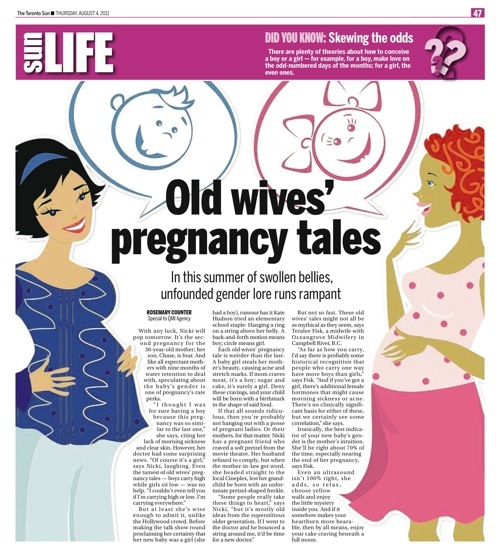 These old wives’ tales might not all be as mythical as they seem, says Teralee Fisk, a midwife with Oceangrove Midwifery in Campbell River, B.C. She sees a lot of pregnant ladies, and a lot of speculation about the babies growing inside them. “As far as how you carry, I’d say there is probably some historical recognition that people who carry one way have more boys than girls,” says Fisk. “And if you’ve got a girl, there’s additional female hormones that might cause morning sickness or acne. There’s no clinically significant basis for either of these, but we certainly see some correlation,” she says. Ironically, the best indicator of your new baby’s gender is — a bit spookily and perfect for old wives’ lore — the mother’s intuition. She’ll be right about 70% of the time, especially nearing the end of her pregnancy, says Fisk. “But we’ve all seen the strongest hunches be wrong, so don’t pick your nursery paint based on this,” she cautions. Even an ultrasound isn’t 100% right, she adds, so relax, choose yellow walls and enjoy the little mystery inside you. And if a little old wives’ tale somehow makes your heartburn more bearable, then by all means, enjoy your cake craving beneath a full moon.